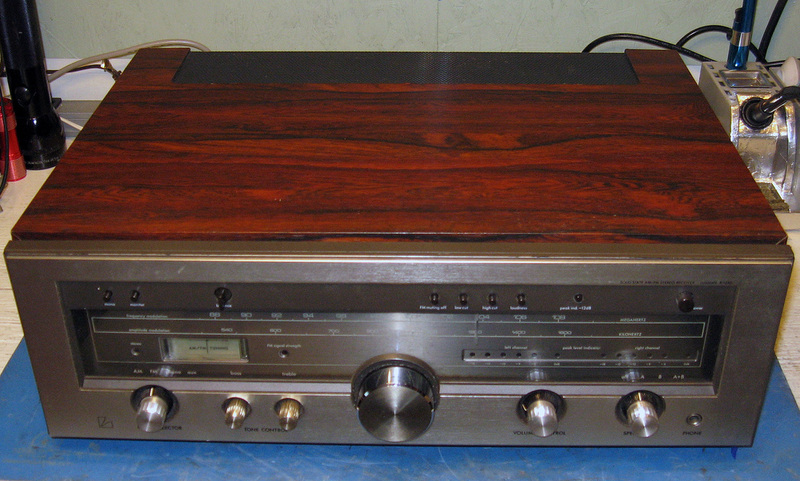 I traded a friend for this vintage 70's stereo receiver. It was sitting on the ground in a storage shed so I wasn't sure it was worth the effort to carry home, but it turned out to be in quite good shape. It was missing most of the original knobs unfortunately and was pretty dirty, but it cleaned up nice and my friend dug up some reasonable looking knobs for it. They'll do until I can try to find original replacements. 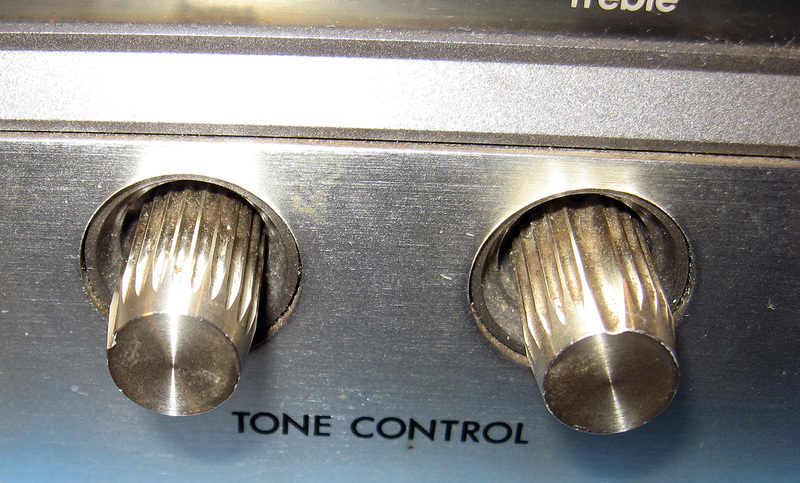 The two small knobs for the tone controls are the only original knobs on the receiver. I'm still searching for an original main tuning knob and the three medium size knobs. 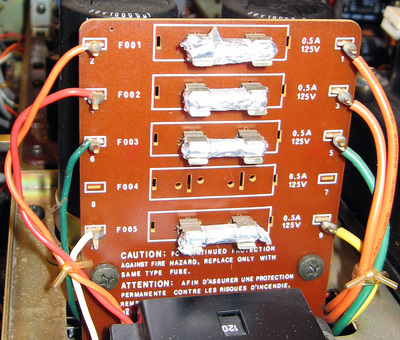 The DC power supply fuses. Each voltage source is fused. 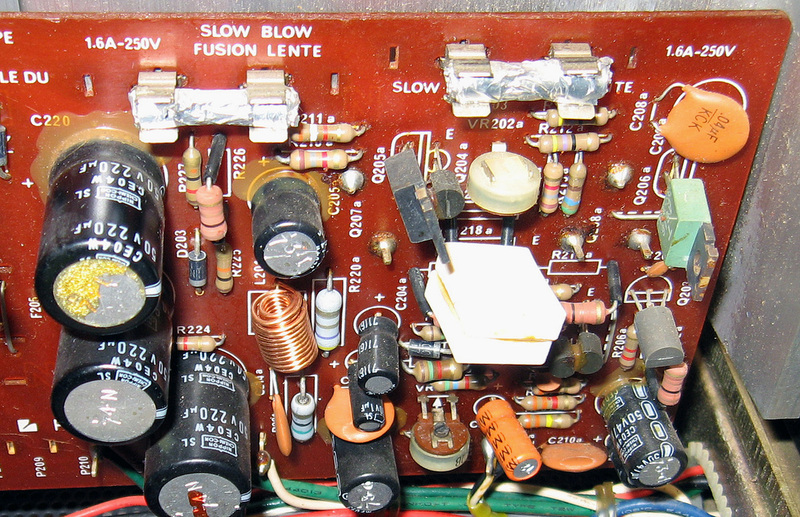 The preamp is also fused. The driver amp and power amps are also fused. There are two fuses on left side of the driver / power amp board. The right side channel of the driver board and its two fuses. 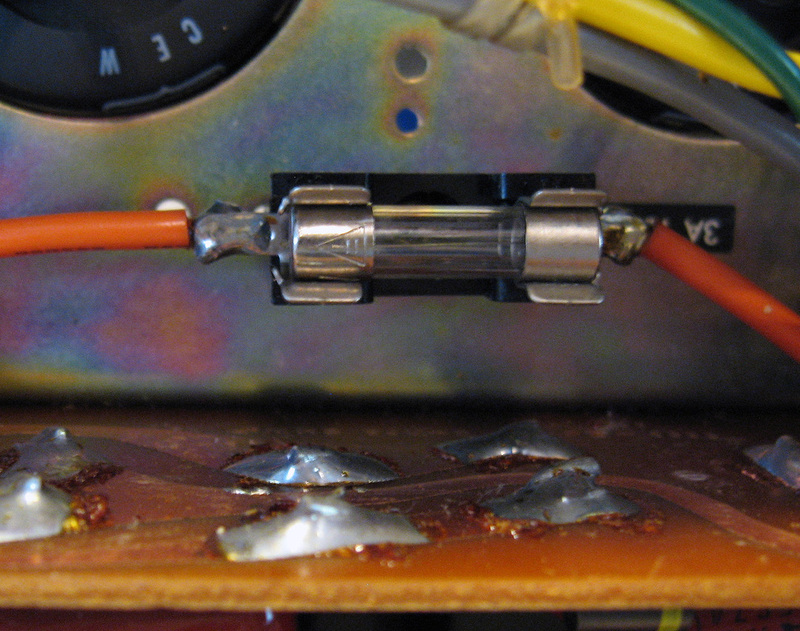 Under the chassis is ine 3-amp fuse for the AC side. It was the only fuse not wrapped in tin foil. 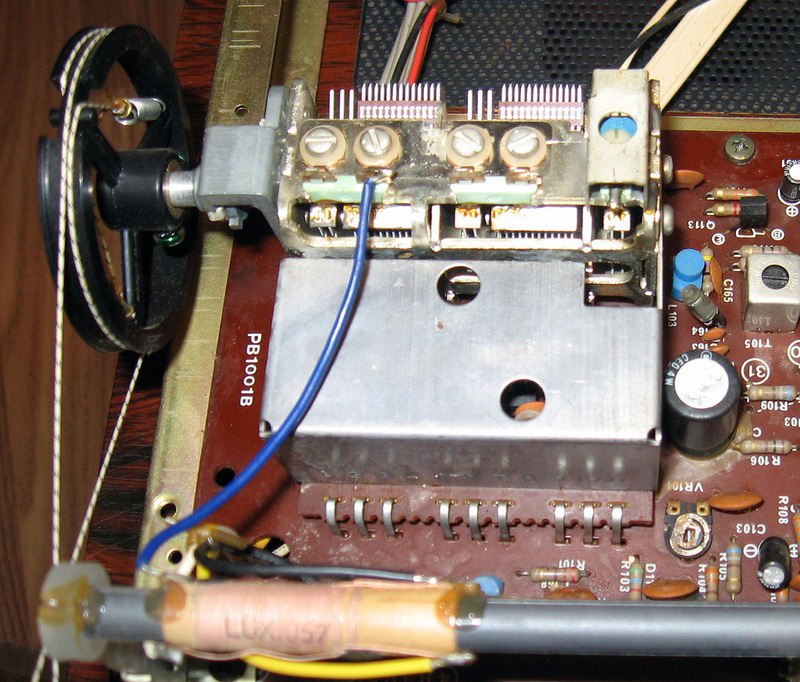 Amazingly, when I installed the proper fuses and powered the receiver up none of the fuses blew, even though there is an obvious problem on the driver board (visible in the 3rd picture). Everything worked except the FM tuner. 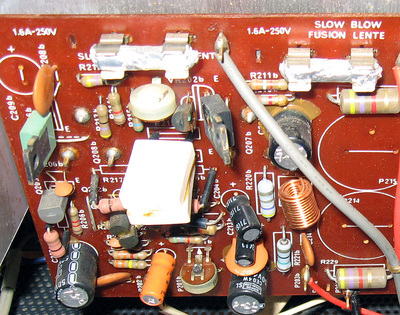 I pulled the FM tuner and checked the FET for the RF amp, and mixer and oscillator transistors but found no problems. However, when I reinstalled the tuner it worked. 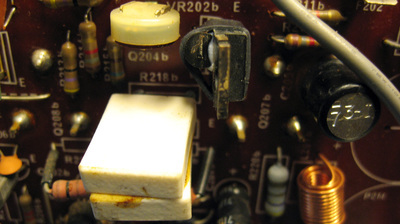 Most likely a bad solder joint somewhere. I recently bought one of the Chinese-made vacuum desoldering stations on eBay and it paid for itself with how easy it made taking this tuner out. And without damaging a single PCB trace. 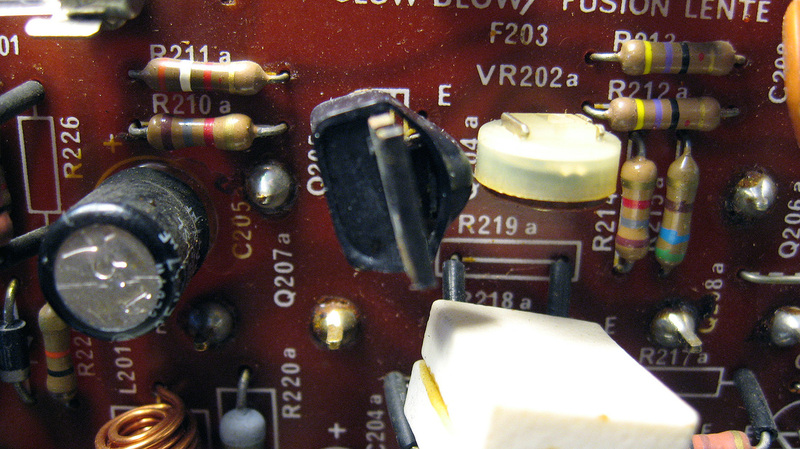 The driver board had one obvious problem (see the first picture below for details). Rather than regluing the transistors I applied thermal grease to the junction between them and shrank a small band of heat-shrink tubing around the pair (saw this on another website for an R-1040 rebuild). 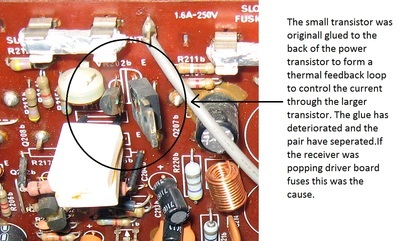 This way a bad transistor can be more easily swapped out. This was done to the transistor pairs on both channels. The receiver chassis cleaned and repaired, ready to go back in the cabinet. 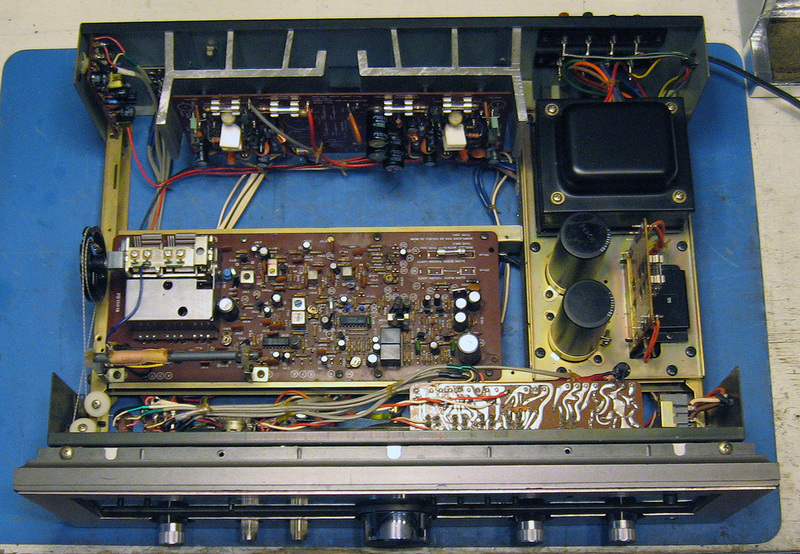 Before reinstalling the chassis I adjusted the amplifier idle current and voltage per the service manual. 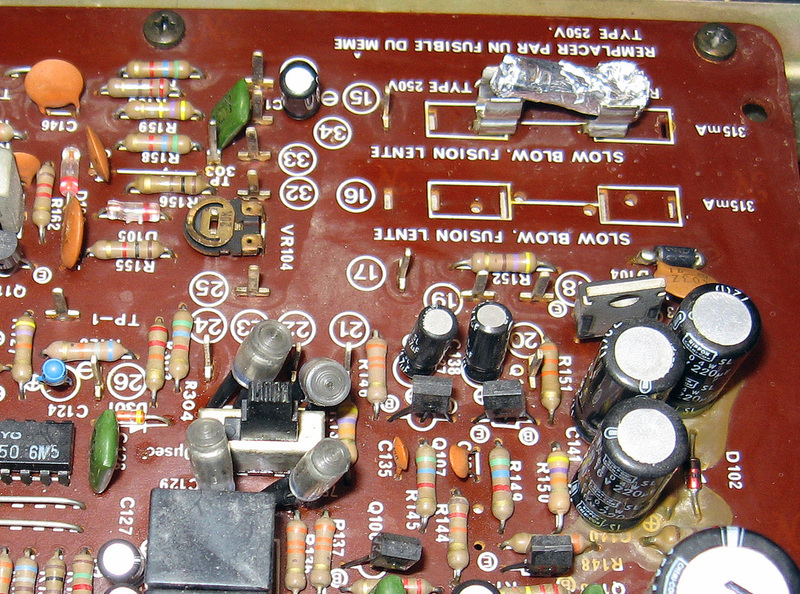 The receiver is still running on all the original capacitors: I didn't find any leaking or swelling electrolytics so I left them be for now. 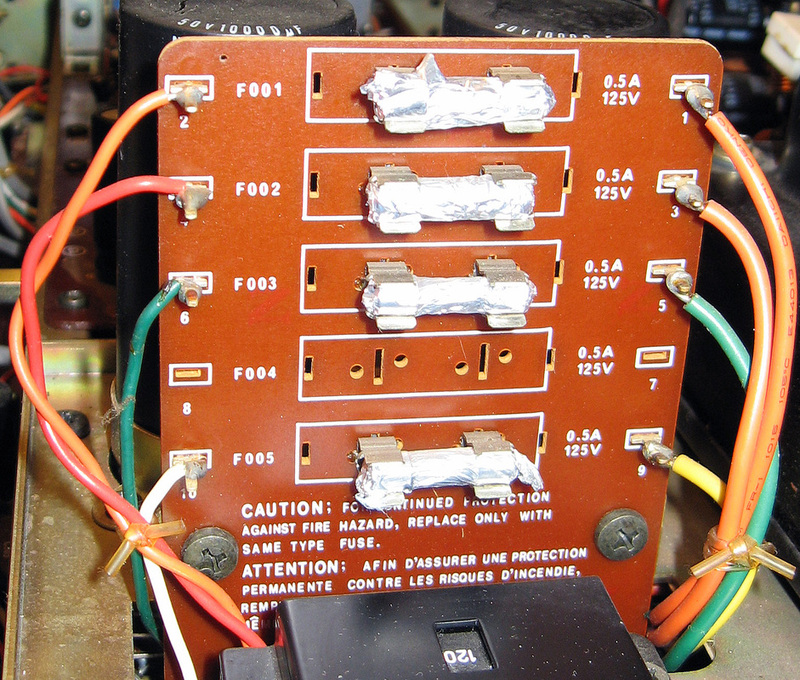 And it has all the correct value fuses now - no more tinfoil fire starters. Just wish I could find those missing original knobs.